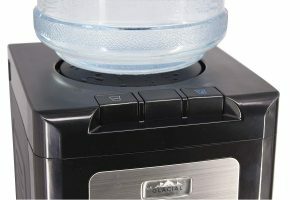 Glacial Spare Bottle Hider Water Cooler has very recently been released at Amazon.com. It has a simplistic yet sleek and modern design with black solid plastic and stainless steel front. As a commercial grade water cooler you can expect a longer life- durability for both the body and the compressor and the refrigeration. This is a top loading water cooler that can be used with both 3 gallon and 5 gallon size bottles. And there is a second hidden storage for your spare bottle just below the drip tray. This will help any clutter on the floor in your kitchen, given that where to store the second bottle is often a problem. And this brand new model gives you this simple yet great solution. Glacial Water Cooler Dispenser is not designed for producing and dispensing hot water, but offers you cold water colder than other competing models on the market. You will get your ice chilled water to drink or to use in your ice-cold beverages, especially on those hot and humid days. There won’t be any water leaking from the defective water bottles with pinholes, thanks to the floor protector leak technology. Normal fridge temperature is around 41 degrees Fahrenheit and most water coolers cool water down to only 50 degrees. And people often complain that water out of such coolers is not cold enough as they are used to drinking from the fridge. As the Glacial Water Coolers use the Ice Chill technology which uses ice to keep water cold, while using up less power, you get very cold water. The nozzles are higher than normal for easier pouring of cold or room temperature water. And you will get water quicker than other similarly priced water dispensers as the water flow is better. The only negative we can point out is the lack of hot water and if you need a model that can produce boiling hot water for your hot drinks and instant meals please check out the alternative models via the links on this page. But if you want very cold water or will need room temperature at times, this one is offered at a competitive price for its sturdy construction, modern design and user-friendly features. These include the longer compressor lifespan, durable body and frame with good quality materials used, water bottle leak guard to protect your floors and ice chill technology that will help offer you much colder water than what other water coolers can. And most importantly the water tastes good at all times.